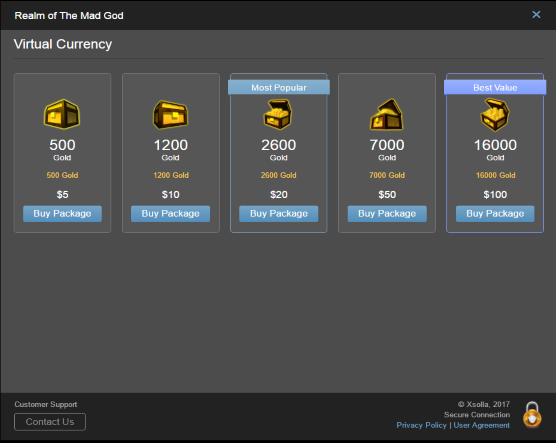 Realm Gold is the premium currency in Realm of the Mad God, obtained through purchase with a credit card, using real-life money. Other forms include, but are not limited to: PayPal, Subway Gift Cards, Amazon Pay, and many more. Realm gold is not tradeable and is used to purchase Dungeon Keys, Pet Eggs, Food, feeding, fusing and Yard upgrades, Dyes and Cloths, as well as weapons, abilities, armor, and rings. As of build 12.0.0, weapons through T12, T5/6 abilities, armors through T13, and T5 rings are available for purchase in the Nexus. Each account starts with 40 Realm Gold to spend. Certain items cost 51 gold or more to prevent people from creating accounts for the sole purpose of free items with free gold. Enter the Nexus on your character and locate one of the 9 Buy Gold icons in the Nexus, and stand on the icon. Click the “Buy” button that will appear in the lower right corner. If you enabled the “Double click for Gold” option in the Options menu, you may go directly to the gold purchase menu by double-clicking the fame/gold display on the top right. If you attempt to buy a item, but don’t have enough Realm Gold, a window will pop up asking you if you want to buy Realm Gold. You can click the “Buy Gold” button to open the gold purchase menu. Select how much gold you would like to purchase. 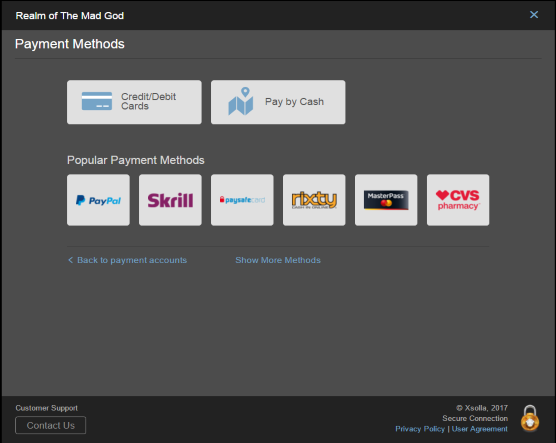 Once you have selected the amount of gold you wish to purchase, you can select your payment method. Your payment could take a few minutes to appear. If it takes longer than five minutes, send a support ticket.